When Did Americans First Become Shocked by Lying? 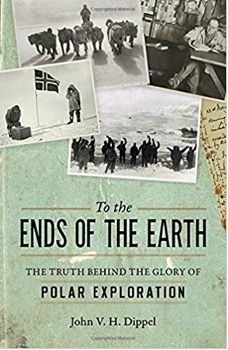 John V. H. Dippel, an independent historian, is the author of many books including, To the Ends of the Earth: The Truth Behind the Glory of Polar Exploration (Prometheus Books, 2018). Frederick Cook claimed he had reached the North Pole in 1908, but he actually never got that far. Although naval engineer Robert Peary proclaimed he had made it there first, evidence strongly indicates he, too, fell short. Over a decade later, Lt. Commander Richard Byrd’s flight log “proved” he had flown over the same spot, but he had, in fact, altered the numbers to make it look that way. Long before the advent of “fake news,” prominent polar explorers misrepresented, exaggerated, and outright lied about what they had accomplished. The temptation to cheat and claim geographical “firsts” which would make them famous was simply too great to resist. And these explorers also knew they could get away with it: no one was in a position to contradict what they had said. There was no striped barber pole marking the poles. Nothing was fixed. At the top and bottom of the earth, “truth” was what the explorers said it was – and what served their ambitions. It had not always been this way. Throughout most of the 18th and 19th centuries, Western explorers had brought with them to wild and uncivilized corners of the planet the values of courage, honor, and duty to country. A naval officer’s word was that of a gentleman, and thus above reproach. One of any expedition’s chief tasks was to collect accurate records – about the climate, sea currents, terrain, magnetic fields, minerals, plant and animal species, and native peoples – and bring these back for the benefit of scientists and, ultimately, all of humanity. To these ends, expeditions meticulously measured temperatures and barometric pressure, under the most forbidding weather conditions imaginable. The leaders and crews of polar parties represented the nations’ finest – honorable, courageous, and invincible argonauts destined to add new glorious chapters to their nations’ histories and affirm their preeminence in the world. Officers and crews of the Royal Navy departed for the Far North brimming with confidence they could meet any challenge the Arctic ice might pose as their ancestors had done before them. During the 19th century, Europeans and the Americans craved such figures, to fill a void created by the long period of peace following the Napoleonic wars and the Civil War. Overcoming hardships in the polar ice gave young men in uniform a new way to prove themselves. On both sides of the Atlantic, public fascination with these intrepid adventurers grew as tales of their exploits were published and found large readerships. The apotheosis of American polar explorers was the Philadelphia physician and daredevil, Elisha Kent Kane, who – after having shown his pluck by lowering himself into an active Indonesian volcano and then rescuing an enemy general during the Mexican War – volunteered to accompany two Arctic expeditions as a surgeon in the 1850s. Kane’s flair with the pen made his accounts of those expeditions gripping and made him the most famous American adventurer of his day: when he died, only in his mid-thirties, Kane’s funeral was the largest in the young nation’s history. But, like Kane, most explorers who ventured into the frozen North and South actually accomplished very much: the obstacles they encountered – ships trapped by ice, expeditions beset by scurvy, starvation, internal dissension, long isolation, and the unremitting cold – proved intractable, and those men who managed to return home felt lucky just to have survived. But the popular appetite for polar exploits did not slacken. The temptation to stretch the truth increased as polar explorers turned their attention to geographical goals which did not physically exist – namely, the two poles. They were the last remaining “prizes” in the great polar sweepstakes. Because of the difficulty in making accurate readings at such extreme latitudes, and their shifting, ephemeral nature, knowing – and proving – that one had made to the top or bottom of the earth – was no easy task. Instruments were not reliable. Weather conditions limited visibility. So, in the end, it came down to the explorer’s word. In earlier eras, this had not posed a problem because a naval officer’s was unimpeachable. It was unthinkable that he would lie. But here, at the extremes of the earth, such normal codes of conduct did not seem relevant. Reality – and what was the right thing to do – was fluid and subjective. It was what the expedition leader declared it was. When Peary and Cook not only contested each other’s claim, but publicly denounced it as a flat-out lie, the public – particularly members of elite explorer clubs and associations – were stunned. This was unheard of – an unseemly, nasty, and demeaning spat between two supposed “heroes,” with epithets flying willy-nilly like snowballs. Someone had to be lying: they both couldn’t be right. That they would treat each other so abominably only made the situation worse. Almost overnight the glossy image of the polar explorer, stubbornly battling the frigid elements for the sake of humanity, was destroyed. And, as this dispute dragged on for decades, their reputations never recovered. Today it is widely believed that neither man ever set foot on the North Pole. Publicly fudging the facts unfortunately did not end in the Arctic. Since the day of Cook and Peary deceiving the public for self-serving reasons has become almost taken-for-granted. It became commonplace during the Vietnam era, creating a crisis of confidence that toppled one presidency and left subsequent ones under a cloud of suspicion. The terms “honor” and “public figure” are no longer seen as synonymous, but as mutually exclusive. In part, we have the deception and dishonesty of polar explorers a century ago to thank for that.